You’ve Been Arrested for DUI in Arizona, NOW WHAT? A DUI charge can be overwhelming — I’m here to help. I’m sorry you find yourself even needing information about DUI in Arizona, but it’s a lot more common than you might think. Whether you’re here for yourself or trying to help a friend or family member, you probably feel a bit lost and have a lot of questions. You’ve probably already done some research, but it can be hard to find reliable information on the internet. Don’t worry, I have written this book with you in mind. Reading this book will help you prepare for the long and difficult process that lies ahead. 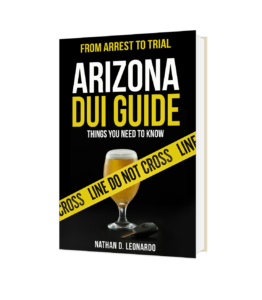 My book, The Arizona DUI Guide, From Arrest to Trial: Things You NEED to Know, will explain what happens in an Arizona DUI case and how you should handle it. The negative repercussions of DUI charges can be significant and can happen very quickly even though these cases move very slowly through the court system. Important decisions need to be made early in the process DUI, so it’s important to educate yourself as soon as possible. This book is a consumer guide that is informative but easy to read. It can also be a valuable reference as you go through the court process, particularly if you are dealing with a DUI case in Tucson City Court or Pima County Justice Court. What are police looking for? What tests am I required to take if requested by the police? How should I deal with a police officer? What about my right to remain silent? Is there any way to challenge a breath test or a blood test? Is there any hope of beating a DUI charge in Arizona? To request this valuable resource, all you need to do is enter your name and email address in the form below and click on the yellow button. You will receive an email confirmation of your request and we will mail you guide to you shortly thereafter. There are no fees or obligations attached to this offer. * Requesting this guide does not create an attorney-client relationship. And don’t worry, the request is confidential and we won’t sell or trade your information to any third party.